Detroit defeated Washington in a shootout at home Saturday and followed with the win at Pittsburgh, the NHL's best home team. PITTSBURGH (AP) — Admittedly not where they want to be in the standings, the Detroit Red Wings still have plenty of fight left. That much was evident this weekend with back-to-back wins against two of the NHL’s best teams. Tomas Tatar and Thomas Vanek scored early third-period goals to lead the Red Wings to a 5-2 victory against the Pittsburgh Penguins on Sunday. Nick Jensen and Steve Ott also scored and Luke Glendening added a late empty-netter for the Red Wings, who completed a back-to-back sweep of Washington and Pittsburgh, two of the top teams in the league. Petr Mrazek made 24 saves for his second win in as many days; he lost his previous four games. Detroit defeated Washington in a shootout at home Saturday and followed with the win at Pittsburgh, the NHL’s best home team. It was the Red Wings’ second victory against Pittsburgh this season. Detroit, which lost five straight before the weekend victories, remained near the bottom of the Eastern Conference standings, but within striking distance of the final playoff spot. Sidney Crosby scored his league-leading 32nd goal and Tom Kuhnhackl added his third with the Penguins short-handed. The Penguins lost in regulation for the first time since the All-Star break. Matt Murray stopped 19 shots. Pittsburgh, which could’ve equaled a season-high 10-game points streak, had points in 13 of its previous 15 contests. But it missed a chance to move closer than five points behind Washington for the top spot in the Metropolitan Division; the Capitals lost to the New York Rangers earlier in the day. The teams combined for three goals in the first 2:23 of the third period. Tatar scored his 14th for a 3-1 lead 27 seconds into the period. 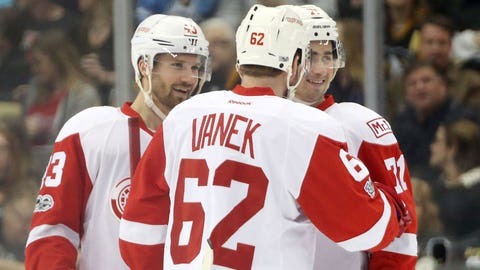 Vanek, who scored Saturday in the shootout against Washington, extended the Red Wings’ advantage 1:49 later when he beat Murray with a wrist shot from the slot. Crosby made it a 4-2 only 7 seconds later with a wrist shot from the left faceoff dot, but the Penguins couldn’t complete the comeback. Penguins defenseman Trevor Daley rang a shot off the crossbar and Mrazek stopped Phil Kessel on a breakaway in the first three minutes of the game. That allowed Jensen to open the scoring when he faked a slap shot and worked around an outstretched Murray on a partial breakaway. Kuhnhackl responded later in the period with a short-handed goal, but Ott put Detroit back in front on a backhander from the slot. Mrazek kept it a one-goal game entering the third period with a sharp blocker stop on Ian Cole and a sprawling glove save on Nick Bonino later in the second period. NOTES: The Penguins honored Crosby for reaching the 1,000-point milestone Thursday against Winnipeg with a pregame ceremony Sunday. Crosby was given a gold-plated stick and a plaque made from the roof of the former Civic Arena by Penguins owner Mario Lemieux. . Pittsburgh played without defensemen Justin Schultz (concussion) and Olli Maatta for the second straight game. Maatta is expected to miss six weeks following hand surgery. Red Wings D Ryan Sproul played on Sunday after Mike Green missed his second straight game with an illness. . Gustav Nyquist and Tomas Jurco were also scratched for Detroit. . Penguins F Conor Sheary, who missed his ninth game with an upper body injury, skated Sunday morning. Red Wings: Will host the New York Islanders on Tuesday before the team’s bye week. Penguins: Visit Carolina on Tuesday before Saturday’s outdoor Stadium Series game against Philadelphia at Heinz Field in Pittsburgh.